Maritime Forces come together in the Arabian Gulf to practice Search and Rescue Techniques. As part of a wider integration with Gulf maritime forces, Combined Task Force 152 (CTF 152) planned and supervised a series of Search and Rescue exercises, known as Exercise Falcon Response, off the Kuwaiti coast. 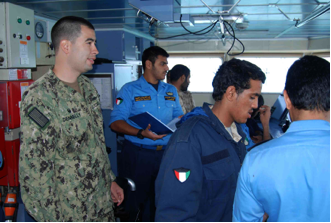 The aim of the exercise was for the navies and coast guards of Kuwait, Bahrain and Saudi Arabia to work together in testing and proving specific Search and Rescue techniques. 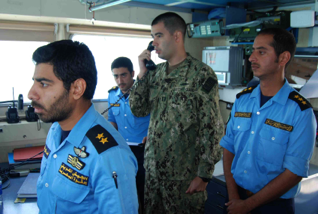 Set against a fictitious scenario in which the Bahrain headquarters of CTF 152 received a distress call from an unknown location, the task groups involved in Falcon Response set about searching for the casualty in the waters of the Gulf. Each vessel in turn was nominated as the On-Site Coordinator (OSC) a task which involved selecting the most appropriate search pattern for the ships to follow, based on their best estimate of where the call came from. They would then coordinate the other ships in searching an area of water for the casualty. Specialists from the US Coastguard attended throughout to provide guidance and expert advice if required. 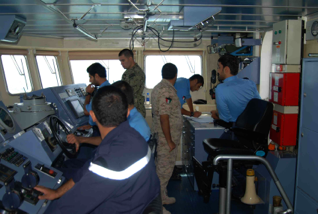 Observers from the Saudi Navy and Coastguard were also present with the intention of participating in future exercises under the CTF 152 banner. 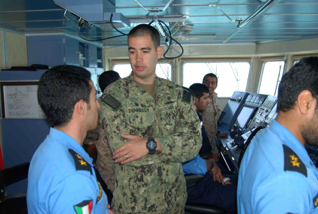 The exercise supervisor, Lt Andy Dennelly US Coast Guard, added: “Having been involved in the planning of Falcon Response, it is such a pleasure to see the enthusiasm with which the Kuwait maritime forces have taken on their roles in the search phases. Participants for Falcon Response included the US Navy and Coast Guard, the Kuwait Naval Force and Coast Guard, the Saudi Navy and Coast Guard, the Bahraini Navy and Coast Guard and the Royal Navy. 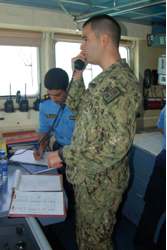 All exercise planning and supervision was managed from Bahrain, by Commander Task Force 152, whose primary role is to coordinate Theatre Security Cooperation (TSC) activities with regional partners, conduct Maritime Security Operations (MSO) and remain prepared to respond to any crisis that may develop.